Union Minister Smriti Irani on Tuesday accused the erstwhile UPA government on “misusing the CBI” to frame BJP president Amit Shah. 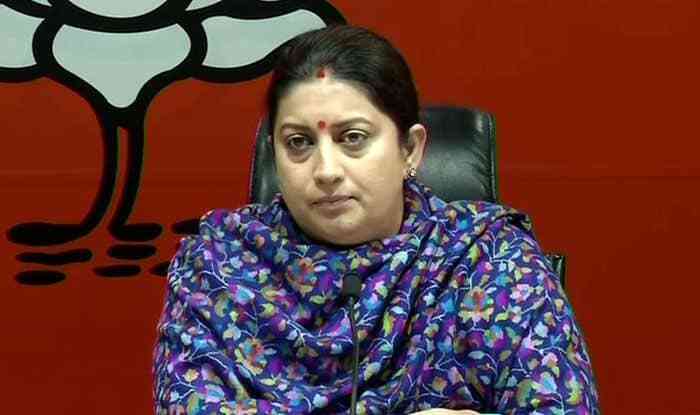 New Delhi: Launching an all-out offensive against the Congress over Sohrabuddin Shaikh encounter case, Union Minister Smriti Irani on Tuesday accused the erstwhile UPA government on “misusing the CBI” to frame BJP president Amit Shah. “The CBI created evidence for a manufactured probe. But, the courts have cleared BJP chief Amit Shah of all charges levelled against him. It was a conspiracy by Congress,” Union minister said at a media briefing. Claiming that the Sohrabuddin case was politically motivated, Irani said, “The entire investigation was carried out according to a set script to achieve certain goals. Truth has finally won in a case that was nothing but a conspiracy by Congress”. The minister further said years of fake propaganda by Congress against Amit Shah has crumbled. The 350-page judgment said: “Having examined the entire investigation and conducted the trial, I have no hesitation in recording that during the investigation of these offences, the CBI was doing something other than reaching the truth of these offences. “I have no hesitation in recording that a premier investigating agency like CBI had before it a premeditated theory and a script intended to anyhow implicate political leaders. And the agency thereafter merely did what was required to reach that goal rather than conducting an investigation in accordance with law,” read the judgment. All the accused, who were mostly police officials from Gujarat and Rajasthan, were out on bail during the year-long trial. The three victims, who were returning to Sangli in Maharashtra from Hyderabad in a bus, were taken into custody by a police team on November 22-23, 2005 night. The couple were taken in one vehicle and Prajapati in another. CBI, the prosecuting agency, said Shaikh was killed on November 26, 2005, allegedly by a joint team comprising Gujarat and Rajasthan police, and Kausar Bi three days later. Prajapati, who was lodged in an Udaipur central jail, was killed in an encounter on the Gujarat-Rajasthan border on December 27, 2006. Of the 22 accused, 21 are junior police officers from Gujarat and Rajasthan, who the CBI said were part of the teams that abducted the three and later killed them in staged encounters. The remaining accused was owner of the farm house in Gujarat where Shaikh and Kausar Bi were illegally detained before being killed. The CBI had charged 38 persons, including Amit Shah, who was then Gujarat home minister, Gulabchand Kataria, the then Rajasthan home minister, and senior IPS officers like D G Vanzara and P C Pande. The prosecution had examined 210 witnesses, of which 92 turned hostile. Shah was arrested in the case in July 2010, but released on bail by Gujarat High Court in October 2010. He was discharged by CBI court in December 2014. Sixteen people, including Shah, Kataria, Vanzara and Pande, were earlier discharged by the CBI court due to lack of evidence. All 22 accused in the alleged fake encounter killings of gangster Sohrabuddin Shaikh, his wife Kausar Bi and his aide Tulsi Prajapati were acquitted last month.